Whether you’re headed to the beach, the ski slopes or just outside (remember, you should wear sunscreen every day! ), today’s post is dedicated to understanding how to pick the best sunscreen for teens, tweens and even toddlers and how to use sunscreen in the most effective way possible. Many sunscreens contain a ton of unpronounceable ingredients whose names don’t really tell you what they are doing in your sunscreen. But if there is one ingredient that you should recognize and love, it is zinc oxide. Zinc oxide has been around for decades and it is still one of the most powerful sun protective ingredients that you will find in modern sunscreens. Zinc oxide, the only natural mineral sunscreen, is the safest and most effective sunscreen agent to defend your skin against harmful UVA and UVB rays (more about these sun rays below!). So why is zinc oxide such a big deal – don’t all sunscreen ingredients do the same thing? Well, not quite; ingredients like avobenzone and ecamsule are better for handling UVA rays, whereas UVB rays are best deflected by ingredients like octocrylene and trolamine salicyliate (see what we said about them being a mouthful?). But zinc oxide is able to provide significant defense against both UVA and UVB rays, which means zinc oxide can offer more protection than most other ingredients. Sunscreens that contain zinc oxide are recommended for all ages, especially kids and teens, as zinc oxide doesn’t irritate the skin and is even suitable for those who have sensitive skin (Skin Cancer Foundation, UV Awareness). Zinc oxide is denser and thicker than chemical sunscreens so a little bit of product goes a LONG way. A lot of people ask us, “What does broad-spectrum mean? And why should it be a part of my sunscreen?” A broad spectrum sunscreen protects against both UVA (the rays that AGE you) and UVB rays (the rays that BURN you). When you look at the SPF rating on your sunscreen bottle, this only judges the sunscreen’s ability to protect against the UVB (burning) rays. The SPF factor does NOT protect you from UVA (aging) rays. You need protection against both types of rays because they can cause serious damage to the skin. UVA rays are largely responsible for aging the skin and causing wrinkles, freckles, fine lines, sagging skin and sun spots, while UVB rays are responsible for burning your skin. In some cases, too much UV exposure can lead to skin cancer. Even if you use a broad spectrum sunscreen, make sure to use one that still has a high SPF rating, preferably one that is at least SPF 30. A sunscreen with SPF 15 can filter out about 93% of UVB rays, while a sunscreen with SPF 30 can protect against 97% of UVB rays. The American Academy of Dermatology recommends a daily use of a broad spectrum SPF 30. Any sunscreen that has a SPF 40 or higher has an active chemical ingredient. Be cautious as these chemicals can burn your eyes and irritate your skin. Almost all spray sunscreens are made with chemicals which means they can burn your eyes and irritate your skin. It’s also difficult to tell whether you have truly applied enough sunscreen when you use a spray-on sunscreen. The pattern that you use to spray your skin and how much the wind is blowing can affect how much sunscreen actually makes it onto your skin. Another thing to consider: most spray-on sunscreens are flammable and may catch fire if they are sprayed near an open flame, like a grill or a bonfire. If you accidentally inhale sunscreen while you are applying, you may also irritate your lungs and leave a pretty unpleasant taste in your mouth. In fact, many dermatologists don’t even recommend children and teenagers use spray-on sunscreens. So for the sake of your skin, it’s best to just use a rub-in sunscreen (Consumer Reports). Tip #1: Be sun smart! 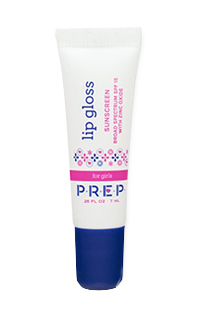 We at PREP Cosmetics are proud to have designed products like our ultra-nourishing SPF 30 Daily Moisturizer and super-hydrating SPF 15 Lip Gloss, which both use the natural mineral zinc oxide to defend your skin against harmful UVA and UVB rays. But despite our awesome formulation, relying on just sunscreen to protect your skin is like eating only fruits in order to remain healthy; you need to take a diverse and multi-step approach if you want to achieve the best results. We recommend pairing our SPF 30 Daily Moisturizer with sun-protective clothing that contains UV ray-absorbing colorless dyes or that has a tight weave (think denim, velvet and silk), as loosely woven clothing gives UV rays more of an opportunity to reach the skin. Darker clothing is best for blocking out the sun’s rays, but your typical bright and breezy summer clothing fails to provide much protection. For example, a white cotton T-shirt only has a UV protection factor (UPF) of 7, whereas a darker cotton T-shirt has an UPF of 10 – this UPF goes as high as 50 if you wear a dark-colored shirt that is also made of a heavier fabric. To maximize your clothing’s sun protectivity, you may also want to consider using laundry additive sunscreens. Simply mix a laundry sunscreen with your favorite laundry detergent, and you can see the UPF of your clothing be improved for up to 20 washings. Although it may be the best time to relax by the beach or the pool, the sun’s UVB rays are the strongest from 10:00 AM to 4:00 PM. If you can, make sure to seek cool shade during this time so that you don’t have to worry about extra-strong UVB rays penetrating and burning your skin. Pair your sun protective clothing with a broad-brimmed hat that covers your neck, cheeks and ears, as well as sunglasses that protect the entire eye area, and you should be ready for sun fun in the sun (Skin Cancer Foundation)! Keep in mind, however, that quickly rubbing some sunscreen into your skin doesn’t guarantee that your skin is fully protected. In fact, people routinely apply only a quarter to one half of what they should be applying to their skin! The correct way to apply sunscreen is to use about 1 oz. of sunscreen for your entire body and each time you reapply. For reference, 1 oz. is approximately the size of 2 tablespoons of liquid. Wear sunscreen every day. An integral part of any skin routine involves wearing a sunscreen every day, regardless of the weather or temperature outside! Remember that UVA rays are strong from sun up to sun down, even in the pouring down rain and UVB rays are the strongest from 10:00 AM – 4:00 PM, so it’s especially important to put your sunscreen on earlier in the day (American Academy of Dermatology, Mayo Clinic). When selecting a sunscreen for anyone at any age, make sure to pick a sunscreen that offers broad spectrum protection and contains zinc oxide. Zinc oxide is the only ingredient that defends against both UVA and UVB rays. It’s also better to buy rub-on sunscreens instead of spray sunscreens. Spray on sunscreens are much harder to get even coverage plus they are chock full of chemicals. To maximize your sunscreen’s efficacy and to keep your skin looking beautiful, make sure to avoid sun exposure during the peak hours of 10:00 AM to 4:00 PM, reapply your sunscreen, seek shade and wear your sunscreen. Remember, when you PREP YOUR SKIN every day of the year (sunscreen! ), you’ll have a lifetime of healthy skin.